Tax-Right LLC (West Berlin, NJ) has agreed to pay SICPA Product Security, LLC (‘SICPA’) a confidential amount in court costs and fees, as a result of Tax-Right dismissing its own frivolous lawsuit against SICPA in September 2012 for an alleged patent infringement (The United States District Court for the Eastern District of Virginia (Tax-Right v. SICPA, Civ. No. 3:12-CV-657)). The settlement also includes Tax-Right’s obligation to retract false allegations that it had made to the industry, including a withdrawal letter to be sent to all concerned parties and issuance of a Press Release clearing SICPA of any wrongdoing. Tax-Right now admits that SICPA does not infringe its patent, and further admits that its patent has no bearing on Master Settlement Agreement (‘MSA’) information capture and verification. The agreement is a victory for SICPA and its customers and puts an end to Tax-Right’s efforts to claim that its patent covers MSA information capture and verification and prevents another empty patent infringement lawsuit from occurring. The Court ultimately found that the Tax-Right patent did not cover or relate to MSA information capture and verification. As trial by jury approached, Tax-Right admitted that its infringement claims against SICPA had no merit and sought to drop the infringement claims and walk away. SICPA, however, insisted that Tax-Right reimburse SICPA for its court costs and fees based on the lack of legal merit of Tax-Right’s lawsuit. THE COURT: I have got to tell you that I am strongly inclined on reading the patent, and I have read your briefs, but I am strongly inclined to say that an order is a customer order. It is just twisting things around to make it something else. Most importantly, the Court finds that the ordinary meaning of the term “item requirements of an order” does not include compliance with the Master Settlement Agreement (“MSA”), but rather the quantity and types of items requested by a customer. SICPA is the leading global provider of banknote security inks and integrated government security systems on high excise tax products in both state and federal jurisdictions currently securing taxes for over 70 billion products worldwide. SICPA has successfully deployed nation-wide and state-operated product tracking and tracing systems in several countries in South America, North America, Europe and Asia. SICPA is a Swiss company, founded in 1927, with Global headquarters in Lausanne, Switzerland and North America headquarters in Springfield, Virginia. At the core of SICPA's security expertise are high-technology security inks which protect the majority of the world's banknotes, identity documents as well as many other value documents from counterfeiting and fraud. The company employs more than 3,000 people worldwide and is established in 28 countries on 5 continents, with products sold to most countries worldwide. SICPA is a trusted government security solutions provider to governments, central banks and high-security printers. For more information visit: www.SICPA.com. Subscribe to our Updated Newsletter! 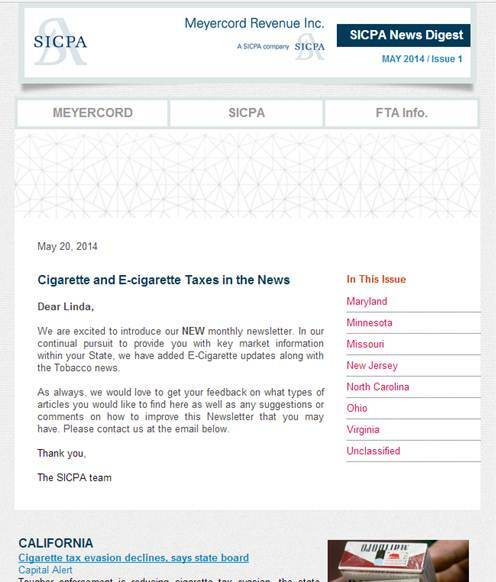 The aim of this Newsletter is to bring you current news articles that pertain to Cigarette & E-cigarette Taxes in all 50 U.S. States.